In April 2017, Maryland Governor Larry Hogan signed a bill reinstating a fracking ban in the state. The Maryland General Assembly imposed a temporary moratorium on hydraulic fracturing for natural gas in 2013, and — following similar bans in Vermont in 2012 and New York in 2015 — the 2017 bill makes Maryland the third state in the country to ban fracking. SkyTruth’s crowd-assisted FrackFinder work mapping oil and gas well pads played an important role in this environmental and public health victory. 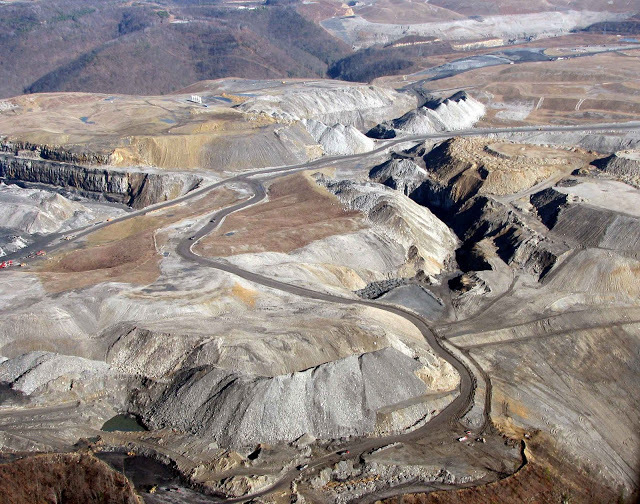 Lawmakers evaluated recent research led by Dr. Brian Schwartz at Johns Hopkins that found higher premature birth rates for mothers in Pennsylvania that live near fracking sites. 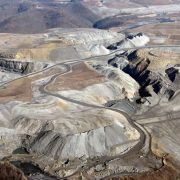 In a related study, Johns Hopkins researcher Sara Rasmussen found that Pennsylvania residents with asthma living near fracking sites are up to four times more likely to suffer asthma attacks. The research conducted by Johns Hopkins relied on oil and gas infrastructure data produced by SkyTruth. That means our work was among the things that Maryland legislators considered when they chose to extend the state’s ban on fracking. It’s incredibly exciting to see our work play such a direct role in policy-making, and it highlights the importance of continuing to update our oil and gas footprint data sets and sharing them for free with researchers and the public. We’re continuing to map the footprint of oil and gas development in Appalachia, so keep checking in for updates. Way to go Maryland! 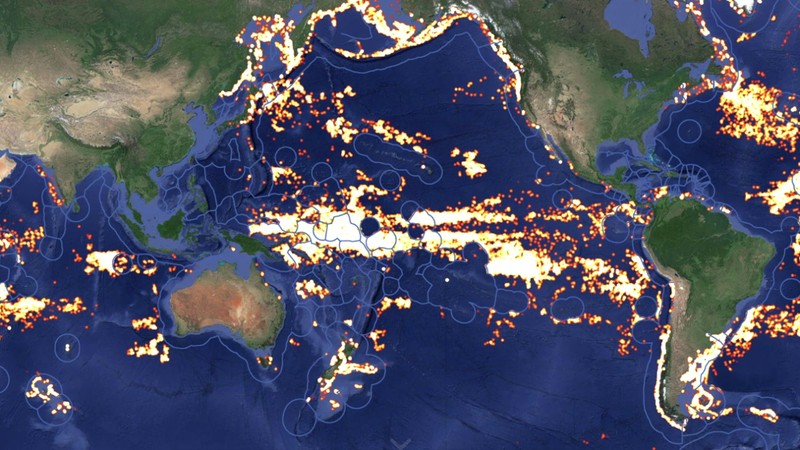 Global Fishing Watch is the product of a technology partnership between SkyTruth, Oceana, and Google, designed to enable anyone to see and understand apparent fishing effort worldwide. This, in turn, will help reduce overfishing and illegal fishing and help restore the ocean to sustainability and abundance. The story of Global Fishing Watch is really the story of a team coming together over the vision of what might be possible with satellite data on a global scale. More than a decade after its founding, SkyTruth had become known as the small nonprofit with a big-picture view of the world. Environmental organizations had been coming to us for help solving challenging problems with remote sensing. We had become a trusted source for unbiased analysis and indisputable imagery that revealed what was once invisible. So when we were asked to turn our analysis to the issue of commercial fishing far out at sea, it was a natural fit. In 2012, Pew Charitable Trust’s Global Ocean Legacy program was encouraging conservation in the rich and diverse waters of Easter Island Province, a remote territory of Chile located in the southeastern Pacific Ocean, about 2,500 west of the mainland. Hoping to demonstrate the need for protection and the feasibility of monitoring, they looked to us for a solution. Satellite photographs of illegal fishing in the area would have easily made the point, but such photos don’t exist. Contrary to common belief, no one is actually taking high resolution, fine-scale images of the entire world at all times. So we had to come up with a new method of looking at fishing behavior far over the horizon. Using low-resolution satellite radar images, we detected the presence of ships in the water based on the radar reflectivity of their metal hulls. Then we learned to work with radio signals broadcast via the Automatic Identification System (AIS) used by many ships to avoid collisions at sea. Combining the data, our analysis showed that fishing was occurring in the open ocean right up to the edge of Chile’s territorial waters. 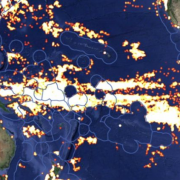 It also revealed that not all fishing vessels were broadcasting their presence with AIS. That was enough to demonstrate that Chilean waters could be vulnerable to unscrupulous fishing behavior, and the Chilean government subsequently stationed a long-range reconnaissance airplane on Easter Island to monitor activity in the area. With that project, we quickly realized the power of AIS data to identify and track fishing activity over the horizon and out of sight. And that’s where the vision began. 2011 turned out to be both a banner year for Brazilian oil exploration and a big eye-opener for the people of Brazil. Fueled by the discovery of 19 new oil and gas reserves and hungry for the spoils, big multi-national companies poured billions of new investment dollars into the South American nation. Most Brazilians expressed little concern over the potential safety risks of the offshore boom. 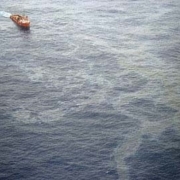 But then SkyTruth president John Amos noticed an inconspicuous report of a seemingly insignificant oil leak buried in the daily cycle of business news. 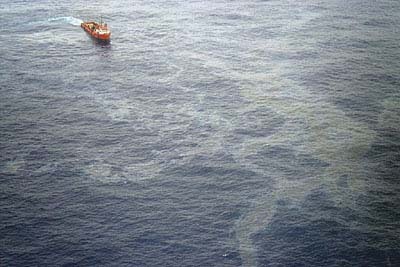 On November 8, 2011, Reuters reported that Brazil’s oil regulator, the National Petroleum Agency (ANP), was investigating an offshore oil leak near Chevron’s Frade field, 230 miles from the coast of Rio de Janeiro. 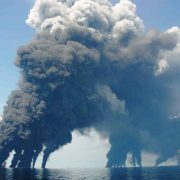 According to the report, Chevron was checking to see if oil was leaking from a crack in the seafloor. When John reviewed satellite photos of the area, he saw a slick originating near an exploratory drilling site that extended for 35 miles and covered about 180 square kilometers. By his estimates the sheen on the water represented about 47,000 gallons of oil. Three days later it had grown to 56 miles in length, and Chevron had declared it a natural seep unrelated to their drilling activities. “It is possible, but call us skeptical,” John posted on our blog. “From my previous years working as an exploration geologist I know there are natural seeps off Brazil. But I’ve never seen a natural seep create a slick this large on a satellite image.” What’s more, comparisons with historical satellite photos showed the slick had not been there before. Over the following days we watched the spread of oil on the water’s surface. While Chevron maintained that it was natural and estimated a leak rate of 8,400 to 13,860 gallons (200 -330 barrels) per day, John posted satellite images that hinted at a much bigger problem. By his analysis the spill was leaking 157,000 gallons (3,700 barrels) per day. That was more than ten times the official estimate. John’s reports and the indisputable images he posted gained international media attention, spurred a vigorous discussion on our site, and led to a public outcry in Brazil. Unable to hide the true nature of the spill, Chevron came under scrutiny from Brazilian legislators and state agencies, and the tone of their official story began to shift. Under pressure for more transparency, the oil and gas giant eventually conceded they had lost control of a well. They claimed the pressure of the reservoir had exceeded their expectations and forced oil up through fissures in the seafloor. According to the New York Times, Brazil’s former environment minister, Marina Silva, said “This event is a three-dimensional alert to the problems that may occur.” She told the Times that the spill served as a warning just as Brazil was preparing to expand its oil production and exploit its tremendously rich presalt reserves—an extremely complicated process because the presalt lies in 10,000 feet of water beneath thick layers of sand, salt and rock. As a result of the spill and Chevron’s misleading response, the ANP banned the company from all drilling activities in Brazil onshore and off, pending a full investigation. After lengthy court battles, the company ended up paying 24 violations, and the company paying $17 million in fines to the ANP, more than $18 million to the Brazilian Ministry of the Environment, and $42 million to settle civil lawsuits. What’s more, it emphasized how small the playing field is in the deepwater oil and gas drilling industry. 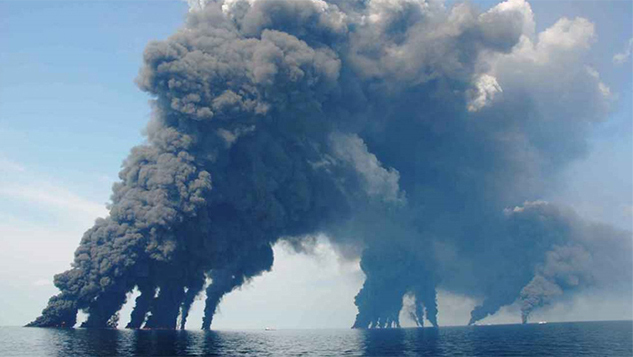 As we learned through our Twitter followers, the drilling contractor on the job had been Transocean—the same company involved in the disastrous BP / Deepwater Horizon spill in the Gulf of Mexico just a year earlier. Brazil dodged a bullet with this accident, but the new understanding of how bad it might have been made Brazilians pay attention. “It was a wake-up call,” said John. “These are multi-national organizations. The same contractors are working for most of the major name-brand oil companies. This kind of thing can happen anywhere.” Chevron’s reluctance to claim culpability and their delayed response to the spill drove home the need for diligence in regulation and enforcement by Brazilian authorities. It was a full year before Chevron was allowed to resume doing business Brazil. During that time, a significant portion of the company’s global investments remained inaccessible to them. We hope the loss of profits, over and above the fines levied by Brazilian authorities, will provide incentives for Chevron to do a better job and will send a message to other oil and gas companies. Accidents can no longer be hidden or brushed aside. 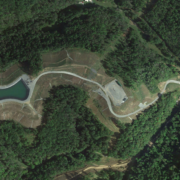 Chevron’s Frade field spill demonstrated that a satellite image can be worth a thousand words — and in this case, millions of dollars.